Oishinbo provides a fascinating look at Japanese food that goes well beyond the usual Western notions. Despite America's obsession with food -- which is so great that we have an entire cable network devoted to the subject -- the task of finding decent literature about world food cultures can be a difficult one. More accurately, plenty of literature exists, but it mostly takes the form of cookbooks or Westerners' travelogues to other countries. While both of these have their place, relatively few of them attempt in-depth explorations of how natives of foreign countries perceive their own gastronomic culture. 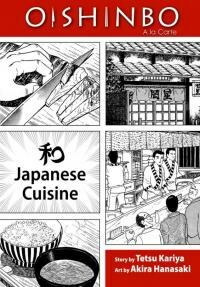 Oishinbo, a manga series created by Tetsu Kariya and Akira Hanasaki, tries to fill this niche insofar as it explains Japanese cuisine from a Japanese person's point of view. While the series isn't without its problems, it does provide a fascinating look at Japanese food that goes well beyond the usual Western notions. Oishinbo has a fairly loose unifying narrative; it serves mostly as a pretext to discuss gastronomy and its related issues. Yamoka, a cynic with an enviable understanding of food, is charged with creating the Ultimate Menu for the newspaper he works for. Along with his friends and co-workers, he travels around dispensing culinary wisdom and squaring off against his father Kaibara, a short-tempered monster with godlike gourmet sensibilities. As the premise might suggest, the book is largely focused on higher-end food, or at least the best possible incarnation of everyday dishes. While the series does occasionally flirt with a few of gourmet culture's less endearing traits -- namely, its tendency to be snobbish and pathologically fussy -- it is commendable for attempting to raise its audience's knowledge and appreciation of food. VIZ Media's release of Oishinbo comes with the subtitle "A La Carte", which is a reference to its publication method. Rather than publish the entire series in the usual chronological order, VIZ has opted to release it in a "best-of" format, with each volume being dedicated to a different subset of Japanese cuisine. While such release methods will invariably prompt complaints from purists, this may be the only way Oishinbo could realistically see an American release. Its extreme length (currently standing at 102 collected volumes) and limited audience have likely doomed any attempt at a complete release. Fortunately, thanks to its episodic nature, Oishinbo doesn't suffer too badly from its out-of-order presentation. The chapters are fairly self-contained, and past events are seldom mentioned, let alone heavily referenced. This is not to say that the series is not somewhat adversely affected. The plot and cast aren't introduced naturally by the narrative, but by a condensed information sheet and an exposition-heavy first chapter. What character development occurs gradually over the course of the series now appears disjointed and abrupt. What this presentation has done is devalue the narrative almost completely, and turn the focus exclusively onto the subject matter: food, cooking, and dining. This may not be such a severe loss, because there's nothing terribly challenging about the story from a structural standpoint. The plot follows the same cyclical story pattern exhibited in young boys' manga like Naruto, InuYasha, and Bleach: each chapter involves a culinary skirmish, usually (but not always) between Yamoka and Kaibara. After the spat ends, everything more or less returns to square one. While some things do change over the course of the series, such as two characters falling in love and marrying, the story is structured to continue indefinitely, as it has for the last 25 years. The cast is hardly more inventive, relying heavily on mostly static, archetypal characters. While they're a fairly genial bunch, there are moments when the food seems to have more personality than the people. At least the food does an adequate job of moving things along. Lovingly rendered in excruciating detail by Hanasaki, the prepared dishes look striking next to the relatively simple character designs. No less attention is paid to the explanations of each dish, as the cast carries on at length about everything they've cooked and tasted. This glut of information, as well as the emphasis on lesser-known ingredients and preparations, all but ensures that readers will learn something new about Japanese cuisine, even if they're already reasonably familiar with it. Yet for all the information to be had in this volume, Oishinbo does retain some of the less desirable traits of "edutainment" products. While rarely boring, it does get a bit dry and talky at times. Oishinbo is by no means the only cuisine-centric manga to reach Western shores, but it is by far the most serious. Whereas most other titles tend to lift inspiration from (if not outright parody) cooking competitions like Iron Chef, Oishinbo tries to take the high road and serve as an educational resource. While it most likely won't replace a good, comprehensive book for someone who desires serious study of Japanese cuisine, it may serve as a perfectly acceptable supplement. For the average reader with an interest in food culture, however, it does an admirable job of providing useful information, sliced into easily digestible chunks.